It is 150 years since the Italian composer Gioachino Rossini died. In his honour, Salzburg's Whitsun Festival presented the comic opera 'L'Italiana in Algeri' amongst other works of his era. The idea came from the Artistic Director and popular soloist mezzo-soprano Cecilia Bartoli who also took the leading role. In the right hands, 'L'Italiana in Algeri' can be funny, pacy and imaginative and that was certainly the case for Moshe Leiser and Patrice Caurier's production. It's an opera about human shortcomings and the clash of cultures. The directors carried clichés to the extremes in a colourful spectacle. And Leiser couldn't be more enthusiastic about his leading lady. "Cecilia loves theatre. Cecilia loves dressing up, Cecilia loves taking on different roles, being shaved, being a man, singing on a monkey, being a mother, arriving on a camel or setting off on an erect missile! She enjoys theatre!" Bartoli stars as an Italian woman who goes to Algeria in search of her lover. In this production, she falls into the clutches of an old mafia boss who she outsmarts with charm and cunning. "Isabella is a woman who takes decisions, who leaves her country, gets on a boat," Bartoli said, describing her character to 'Musica' reporter Andrea Buring. "I think she's a woman who wants to learn about a new culture, new food, different people speaking different languages. That's it. It's about yearning...a desire for discovery." When the opera was written, women's rights were not the issue they are today. However, Leiser sees it as having a message for female empowerment! "In Rossini's day, women were almost always potrayed as fighters... strong, smart, clever, shrewd," he said. "A genuine call for equality between men and women"
"Even in this libretto, there is a genuine call for equality between men and women." Romance, however, is not part of the mix. "In a comedy, there's no place for a love duet," he told 'Musica'. "Because in a comedy, to put it rather crudely, it is not love that matters but sexual desire that is important! That is what makes us laugh." "Rossini puts laughter in there but more than that, a 'life force' comes from his music. There is blood running through it. It has incredible energy," added Patrice Caurier. It's that energy that appeals to the 'Italian in Salzburg'. Rossini is Cecilia Bartoli's favourite composer. "'L'Italiana in Algeri' - it's sheer madness! Nobody can get their bearings.There's this tatatata! Boom boom boom! It's a moment of pure insanity. The insanity that carries us away!" she said. "The composer Rossini can take us into another incredible dimension, as always, with effervescence." 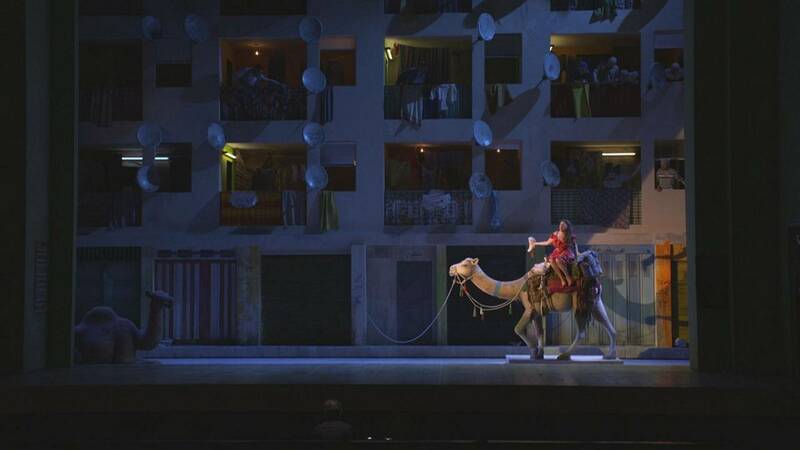 'L'Italiana in Algeri' will be back on the programme of the Salzburg festival in August.